Industry Experts released the 2017 version of its global market report on Biosensors. The new report entitled “Biosensors – A Global Market Overview” reveals that the Security & Biodefense is projected the fastest growing Biosensors application area with a CAGR of 10.8% over the same period 2017-2022. Biosensors have penetrated fields as diverse as medical, environmental, food processing and biodefense, with each of these areas showing impressive growth. Also, an unabated increase in chronic and lifestyle-related diseases has compelled individuals to adopt biosensors in order that their health status can remain under constant monitoring. Biosensors lend themselves to be customized for monitoring a number of biomarkers that is highly useful in monitoring and detecting several diseases. Growing accuracy of biosensors is further expected to expand the scope of applications, leading to an increase in potential demand for them. Global Biosensors market is expected to record a robust CAGR of about 9% during the 2017-2022 analysis period and is projected to touch US$25.9 billion by 2022 from an estimated US$16.9 billion in 2017. Electrochemical estimated the largest global Biosensors market by technology with 2017 market stood at US$12 billion while Optical segment is expected the fastest growing biosensor market worldwide with a CAGR of 10.5% over the same period. The study analyzes the Biosensors Technology Areas including Electrochemical, Optical, Thermal and Piezoelectric. This report also explores the global market for Biosensors Application Areas comprising Home Healthcare, Point of Care Testing, Environmental Monitoring, Research Laboratories, Process Industry and Security & Biodefense in terms of value in USD for 2014-2022 analysis period in the global markets comprising North America, Europe, Asia-Pacific, South America and Rest of World. 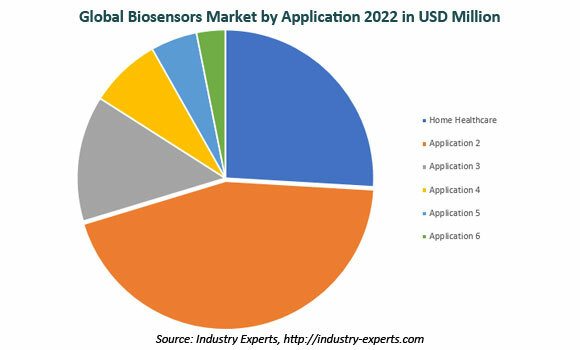 The global market for Biosensors is segmented into five major regions namely, North America, Europe, Asia-Pacific, South America and Rest of World. The regional markets further analyzed for 16 independent countries across North America – The United States, Canada and Mexico; Europe –Germany, France, Italy and the United Kingdom; Asia-Pacific – China, Japan and India; South America – Brazil and Argentina. The market is analyzed in all of these major regions by key countries, technology area and by key applications in terms of USD. This 280 page global Biosensors market report includes 171 charts (includes a data table and graphical representation for each chart), supported with meaningful and easy to understand graphical presentation, of market numbers. The report profiles 24 key global players and 65 major players across North America – 47; Europe – 14 and Asia-Pacific – 4. The study also provides the listing of the companies operating in Biosensors industry. The global list of companies covers the address, contact numbers and the website addresses of 184 companies.